Babies have thoughts and feelings they want to communicate with you much sooner than they develop the verbal skills to be able to express those thoughts through speech. 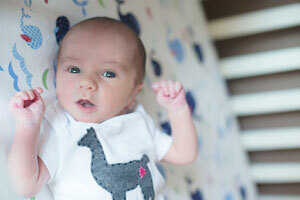 My son waiving his hands at about one week old. Babies communicate by crying differently in different circumstances, cooing and smiling in response to you, making baby-babble sounds, making facial expressions, mimicking your gestures, waiving their hands, and squeezing your fingers. There are theories and even products to help parents analyze their baby’s cries, but you don’t have to be a baby whisperer to understand what your baby is trying to communicate if you give them tools to express themselves in a way you can understand – baby sign language. On average, babies don’t start to say words until around 1 year old. However, their cognitive skills for thinking, feeling, and recognizing action and reaction develop much earlier. They also develop hand-eye coordination at an earlier age – first they squeeze your finger and eventually they point, wave, and mimic your gestures. 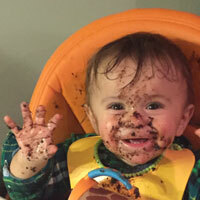 Babies naturally use their hands and facial expressions to communicate. Both of my sons, like many babies, would pucker their lips into an “O,” tilt their head to the side, and punch their little fist in the air when they were hungry. They are instinctively looking for the breast or bottle, but they are also clearly communicating through their hands and facial expressions. Because babies are able to make and mimic gestures, they are able to learn baby sign language and use it to communicate before they can talk. Baby sign language is the use of signs to communicate with infants and toddlers. It’s not its own language. 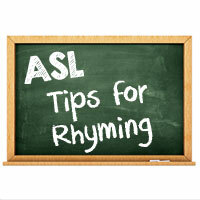 When you teach signs to a baby, often you would use American Sign Language (if you are in the United States or Canada where American Sign Language is used, otherwise you would use the sign language used in your region, such as British Sign Language or French Sign Language), but some people use other types of sign language or even use modified or made-up signs. Of course, we recommend using American Sign Language (ASL). 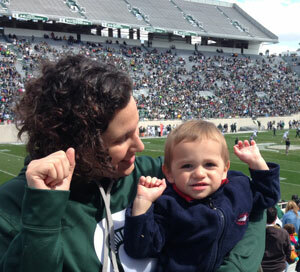 There are many advantages to using ASL when teaching your hearing baby to sign. It is a real language. Because it is a real language, other people are familiar with the signs, there is no need to “remember” a made-up sign, and there are resources to use to look up signs (Signing Savvy, of course!). Knowing ASL is also fun for children when they see others using it. As the child grows up, they may meet deaf peers or other people who know ASL. Some preschools and daycares are beginning to incorporate sign language into their curriculum and it is becoming more common to see ASL in popular media, such as commercials, television shows, and movies. Of course, the greatest immediate benefit is that your baby is able to communicate with you and you are able to understand them. We started signing with our first son when he was born. MILK is the first sign he started to use and the sign that he would use most often (he still has an addiction to milk at the age of 2.5 years old!). He would use some signs, but I remember clearly the first time he used sign to really make a strong statement. I had given him a sippy cup with water in it. He instantly started to cry, dramatically threw the sippy cup on the ground, and forcefully raised his fist in the air and began repeatedly signing milk. His actions, combined with his signing, made his message very clear: “Mom, this water is not going to cut it. I want milk! !” So although he had a mini tantrum, it was short-lived because I knew he wasn’t frustrated just because he didn’t want water, but because we wanted milk – and NOW! Although most useful for understanding our son’s desires, signing was also a great way for us to learn and practice vocabulary together and get a glimpse into his thoughts. One example is we would use animal signs when reading books with animals and when playing with animal toys. Because he wasn’t talking yet, it was hard to know if he was learning the animal names, but we were happily surprised when we went to the zoo and he was excitedly signing all of the animals to us as we saw each new animal. It’s easy to start signing with your baby and it’s amazing to be able to communicate with them through sign before they are able to talk. To get started, simply use signs when communicating with your child. There isn’t a “right” way or specific order to learning or teaching signs, just start by picking signs that make the most sense in the context of your baby’s life. Acredolo, L. & Goodwyn, S. (2002). Baby Signs: How to Talk with Your Baby Before Your Baby Can Talk. Chicago: Contemporary Books. Gongora, X. & Farkas C. (2009). Infant sign language program effects on synchronic mother-infant interactions. Infant Behavior & Development, 32, 216-225. Vallotton, C. (2012). Infant signs as intervention? Promoting symbolic gestures for preverbal children in low-income families supports responsive parent-child relationships. Early Childhood Research Quarterly, 27(3), 401-415. Goodwyn, S. & Acredolo L. (1993). Symbolic gesture versus word: Is there a modality advantage for onset of symbol use? Child Development, 64(3): p. 688-701. Goodwyn, S., Acredolo, L., & Brown, A. L. (2000). Impact of symbolic gesturing on early language development. Journal of Verbal and Nonverbal Behavior, 24(2), 81-103. Acredolo, L. & Goodwyn, S. (2000). The long-term impact of symbolic gesturing during infancy on IQ at age 8. International Society for Infant Studies. Brighton, U.K.
May I print this or link to it, to share this article with the patrons at our public library? Hi Erica! Yes, of course, feel free to share this article. We have more baby sign language articles coming in the near future too! Next week, from March 22 through March 29, our Sign of the Days will feature iconic signs. Iconic signs convey the meaning of what is being signed. Look for the signs for HELLO, DRINK, EAT, AIRPLANE, CAR, BICYCLE, TYPE, and BALL. You can see more iconic signs by visiting the Iconic Signs wordlist from the soon to be released book Activities in American Sign Language published by the Registry of Interpreters for the Deaf (RID) Press. The book by Brenda Cartwright and Sue Bahleda groups signs by topic with practice sentences and great activities - a fun way to learn and practice American Sign Language. Check out the wordlists that correspond with the book and watch for the book to be released soon! Hi, will the book have some pages/signs that can be printed off to put on a wall? I have a friend who is teaching her charges some basic signs; milk, eat, more, bathroom... Or is that something available through Baby Sign? I look forward to seeing this book. The book is a great resource for teachers to use because it is all about ASL actiivites that can be done in the classroom. The activities allow for both expressive and receptive practice to support and enhance vocabulary and grammar in fun, but meaningful ways. The book doesn't show signs or have images for signs. That's where Signing Savvy comes in. You can use the Signing Savvy website to look up words and see video of them signed. As a full member of Signing Savvy, there is a printing feature that allows you to pick any image from the sign video and print it. Sweet. Thank you very much. Read Across America Day is every year on March 2nd - Dr. Seuss’s birthday. The whole month of March is also National Reading Month. The events are used to encourage reading and literacy. Reading any book is great, but the National Education Association chooses a book every year and this year’s book is the Dr. Seuss book Oh, The Places You’ll Go. Find these and more printable activities to accompany Dr. Seuss books at the Seussville's Read Across America page. The National Education Association website also has resources for planning a reading event and resources for finding free books for the classroom. How ever you spend Read Across America Day or National Reading Month, we hope you enjoy a good book! For more on the importance of reading to children and tips for reading with children who are deaf and hard of hearing, see our article on Tips for Reading to Deaf and Hard of Hearing Children. Motivating children to read is an important factor in student achievement and creating lifelong successful readers. Research has shown that children who are motivated and spend more time reading do better in school. For more information on Children's Literacy visit the National Education Association website. Over 90% of deaf or hard of hearing children are born to hearing families and there is often a lack of communication between hearing parents and their deaf child. Using sign language when reading increases comprehension, which helps children become more engaged in the story being read and more interested in learning to read themselves. Parents can use the word list feature on Signing Savvy to create a custom word list of signs that go with a book they are reading. The Signing Savvy quizzing and digital flash cards features can be used to practice the signs from the word list and, of course, it is best to sign while reading the book. This is a way for both parents and children to practice signing together and learn new signs. Teachers can also create custom word lists of signs that are used from books read at school and then share those word lists with parents. Then parents have great recommended books for signing and reading at home that align with the classroom curriculum. Some great tips for reading to deaf and hard of hearing children were outlined by David R. Schleper in the publication Reading to Deaf Children: Learning from Deaf Adults. The tips were developed through research of what deaf parents do when reading to their deaf and hard of hearing children. 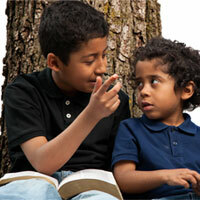 Translate stories using American Sign Language. Focus on concepts and use lots of fingerspelling. Keep both languages (ASL and English) visible. Make sure children see both the signing and the words and pictures. Elaborate on the text. Add explanations about the text to make it more understandable. Reread stories on a “story telling” to a “story reading” continuum. The first few times, make sure the student understands the story. Then, slowly, focus more and more on the text. Follow the child’s lead. What does the child wants to read? What if the child wants to read just one part of a book, then move to another? Follow the child. Make what is implied explicit. Make the hidden meaning clear. Adjust sign placement to fit the story. Sometimes sign on the page. Sometimes sign on the child. And sometimes sign in the usual place. Adjust the signing style to fit the story. Be dramatic. Play with the signs and exaggerate facial expressions to show different characters. Connect concepts in the story to the real world. Relate the characters to real events. Use attention maintenance strategies. 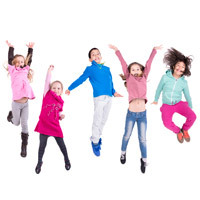 Tap lightly on your child’s shoulder, or give a gentle nudge to keep his or her attention. Use eye gaze to elicit participation. Look at the child while reading. Engage in role playing to extend concepts. Act out the story after you have read it. 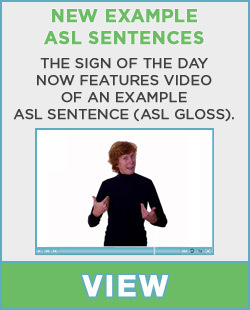 Use ASL variations to sign repetitive English phrases. If you are using the same phrase over and over, vary the signs. Provide a positive and reinforcing environment. Encourage the child to share ideas about the story and support the child’s ideas. Expect the child to become literate. Believe in the child’s success and read, read, read! They can also be found as part of the webpage on "Reading to Deaf Children" from Gallaudet University's Laurent Clerc National Deaf Education Center. U.S. Department of Education. 1996. Reading Literacy in the United States: Findings From the IEA Reading Literacy Study. U.S. Department of Education, National Center for Education Statistics, 2000. Educational Testing Service, 1999. America's Smallest School: The Family. Help students get back into the swing of the school year by showing them our 12 special "Back to School" instructional WonderGrove animations featuring sign language. The "Ask the Teacher for Help" animation is great to encourage students to ask for help when they are confused. Accompanying the animation, there are extention lessons for Pre-K, Kindergarten, First Grade, and Second Grade, all which have been crafted by educators and align to the common core standards. Download the extension lessons and use them at home or in class for easy activities that reinforce the lesson. You can also use our pre-made Signing Savvy Ask the Teacher for Help word list to go through the signs in the same order that they are shown in the animation. Get free access to all of the "Back to School" WonderGrove instructional animations featuring sign language while you still can! We are offering 30-day free trial promotion, but you have to sign up by September 12, 2014. Register for the free WonderGrove trial and find out more.